Sri Aurobindo (click here to see biography) is one of my greatest heroes and his writings have been one of the greatest influences and inspirations in my life. I have recently become aware of a bemusing academic controversy amongst the more scholarly followers of Sri Aurobindo on the subject of whether he should be considered a Hindu and whether his teachings could be classed as Hinduism. Hindu Voice has published in the past an article that deals with the fact that many western or westernised followers of Hindu gurus will do their utmost to dissociate themselves from the word “Hindu” – it is precisely the same psychology described in this article which is at play here (click here to read article – “The dreaded H-word”). Such individuals who try their best to escape any association with the word Hindu typically feel that their sage/guru is of universal importance, belonged to the whole world, and cared about everyone – Hindu or non-Hindu alike. Therefore it is a travesty for such a great universal teacher to be called a Hindu. What they fail to realise is that the basic teachings of Hinduism (the Vedas, Upanishads, Gita and other sacred literature) are every bit as universal as their own cherished guru. All the thousands of true Hindu sages through the passage of time have always said that their teachings are universal, and have had a concern for all humanity. This does not make them non-Hindu. This just means that at its core – Hinduism itself is universal and embraces the whole of humanity, allowing all to drink the nectar of its wisdom without giving up their identity. But they don’t want to attribute the quality of universalism to Hinduism, because it is unfashionable; Hinduism being associated in the media with backwardness and social ills. I would have to write a 10-20 page article to deal with all of the arguments I have encountered with regards to Sri Aurobindo from various authors, but for the purposes of this article I just want to pick on one statement that I have come across to demonstrate the childish thinking on which the whole issue is based. This is quite wrong. Sri Aurobindo acknowledges that he first achieved direct spiritual experience reflecting upon and practicing the yoga of the Bhagavad Gita and Upanishads, with intense devotion to Krishna. Without these he would not have been able to achieve his spiritual realisations, and develop his philosophical teachings. On the other hand, modern science was not developed by persons who were following a Christian line of thought or enquiry. It was developed by enquiry and study into material reality, independently of religion. Hence, the relationship between Sri Aurobindo and Hinduism is quite different to the relationship between modern science and Christianity. 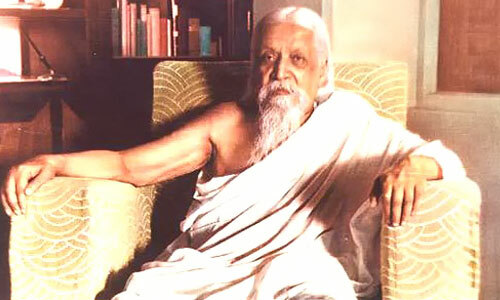 Sri Aurobindo’s teachings can be said to be unique and universal – but these teachings would not have developed without the creative field of experimentation that Hinduism provides. Sri Aurobindo was a heroic spiritual experimenter, like the ancient Vedic sages, who wanted to use his experiences and knowledge to transform and save the world. It is accurate to say that the teachings of Sri Aurobindo flowed out of traditional Hinduism. The development of modern science did not flow out of Christianity. In some respects it developed in spite of Christianity. The Church often tried to silence persons whose research led them to propose hypotheses that went against certain Christian notions such as the world being 6,000 years old, the world being flat, and the sun going round the Earth, opposition to the theory of evolution etc. By contrast, Sri Aurobindo faced not one iota of difficulty or persecution from the Hindu orthodoxy in publishing whatever he wanted to and pursuing whatever line of spiritual enquiry and experiences he preferred. To summarise, I’m not saying that one has to “limit Sri Aurobindo to Hinduism” if they don’t want to, but it is ridiculous to say that “to limit Sri Aurobindo to Hinduism is like characterising modern science and technology as purely Christian, since by and large they originated in the Christian countries”. The relationship between Sri Aurobindo’s teachings and Hinduism is radically different to the relationship between modern science and Christianity. Sri Aurobindo’s writings on Indian art, culture, politics convey the forward looking and living essence of Hinduism in a way that both the ‘secularists’ and the ‘saffronists’ could learn much from. Great article – wish you had added quotes from his works to illustrate his stance on Hinduism. Reblogged this on Vande Mataram .